We all want to feel appreciated. It’s an innate desire to know that what we do affects others in a positive way. As leaders, we have the ability to impart mood-altering, encouraging words to our own team members. Appreciation can be the difference in motivating a team to new heights and creating a revolving door of turnover at your organization. Although most people understand its importance, appreciation through words or actions is often hard to come by in an office setting. According to a survey by the John Templeton Foundation of West Conshohocken, Pa., a nonprofit research organization, 10% of workers express gratitude to a colleague daily, while only 7% show appreciation to bosses. There is a disconnect between the amount of times appreciation is shown with the knowledge of its impact. According to Society for Human Resource Management, about half of human-resource managers say showing appreciation to employees helps reduce turnover and increase profit. Productivity and engagement is obviously directly connected to how employees understand their impact and influence in the overall company picture. So to ensure high moral and better employee participation, consider these quick tips to show appreciation to your workforce! For millennia, people have been imparting the power of written words. Whether through manuscripts, stories, or personal notes, humans have used this tried and true way of communicating effectively, though lately, this art has been used less and less. Sometimes, the best way to show how much you appreciate someone is with a hand-written note. On several occasions, I have gotten encouraging words from executives through this medium, and its power to encourage and increase productivity is indefinitely evident. Another way to show appreciation is by expressing individuals’ personal achievements in the presence of their peers. Whether in weekly meetings or department luncheons, use the first five minutes to point out a couple employees who have completed a project or went out of their way to help out a client with a specific need. There is a classic song by the 80s band Loverboy that can be applicable to some of your employees: everybody’s “Working for the Weekend.” Even highly engaged employees still enjoy time off to spend with friends and family. One surefire way of making your employees feel your appreciation is by giving them paid time off. If you can, surprise your team with a half day on Friday to fast forward their weekends. Or if you can’t afford to have an empty office, have them draw cards out of a hat with different times on them. Another time-tested celebration of a job well done is throwing an office party. The short break from your team members’ daily whirlwind can work wonders in revitalizing them and providing a new sense of productivity. If you manage a service company and can’t get away from customers or phones for thirty minutes, then consider bringing in donuts in the morning, pizza for lunch, or dessert for the afternoon. It’s true what they say – cash is king. Sometimes the simplest way to show gratitude to your employees is by giving gift cards or bonuses. It takes the least amount of planning and time away from work, and it allows your staff the choice of how and when they use it. Better yet, try starting an incentive program where they work to get a specific gift card or cash bonus. Sometimes healthy competition does wonders to a company’s engagement and productivity. There are dozens of ways you can make your employees feel your appreciation. You could even combine some of these tips. 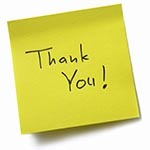 What are some ways you’ve shown gratitude to your workforce? Let us know in the comments section below!